It is natural to worry if your pet is ill, so our vets are on-hand to listen, observe and discuss your pet’s clinical signs in order to diagnose what is wrong. To ensure rapid and accurate diagnosis, we have invested in state-of-the-art facilities and equipment to assist us. We have a large and spacious, welcoming reception area with a separate cat section to minimise any stress to your pet when visiting the practice. Our consulting rooms are custom designed to be comfortable for both pet and owner, and include a dedicated room for our veterinary nurses to hold health clinics. We are an “MRSA free” practice and regularly monitor all areas of the hospital. The practice is professionally cleaned each night and all areas, including walls, are treated with antibacterial and anti viral agents to minimise any risk of infection occurring. Forest House has two operating theatres; one is dedicated to soft tissue surgery and the other is specifically for orthopaedic surgery. When in the theatres, all staff are suitably clothed in theatre scrubs with sterile surgical gowns and gloves as set by our own high standards. 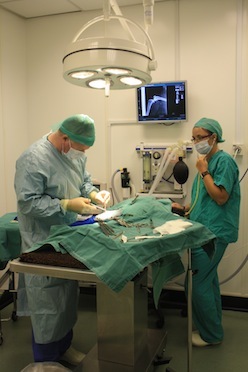 There is a dedicated recovery area where your pet is continually monitored by a nurse until it fully recovers and is able to be assisted through to the separate dog and cat wards. There is also an oxygen tent on hand for emergency use. We use the best available anaesthetic agents and protocols in a completely controlled environment. We have state-of-the-art electronic monitoring together with one-to-one nurse care. We treat each pet individually through any procedure to ensure a comfortable recovery and convalescence. Dental disease is a common problem in dogs and cats. If left untreated, it can lead to more serious conditions which effect the heart, lungs, kidneys and other parts of the body, due to the spread of bacteria. Regular dental check-ups are an important part of oral health, so at Forest House Veterinary Group, you can book a free dental check with a nurse at any time. 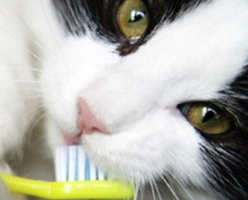 However, daily brushing is the best way to prevent dental disease and special dog and cat toothbrushes and toothpaste can be purchased from the practice. Should your pet require dental treatment, we use similar equipment to that found in a human dentist, except all of it is specifically designed for use on pets! With this equipment, the Forest House veterinary team are able to extract unwanted teeth, remove plaque and tartar with an ultrasonic descaler, as well as polish your pet's teeth with special toothpaste. These procedures need to be carried out under general anaesthetic as animals cannot be persuaded to keep still with their mouths open! 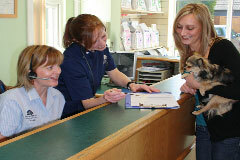 Our hospital includes spacious and comfortable wards – one for dogs and another for cats. As with other areas of the practice, these are kept scrupulously clean and disinfected. 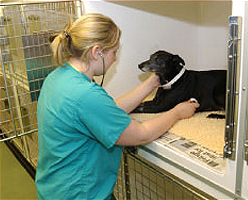 The temperature on the wards is carefully monitored and the surgery's air conditioning systems ensure that pets are kept as comfortable as possible during their stay. The pets in the wards are constantly monitored by a dedicated nurse and comprehensive records are maintained for each patient. The animals are encouraged to feel 'at home' and clients are invited to visit their pets in the hospital when mutually convenient. We have invested in the most up-to-date laboratory equipment, which can rapidly analyse your pet's blood sample giving almost instantaneous results for a very comprehensive range of tests. These tests are therefore available 24/7 and we rarely need to send samples to an outside laboratory. 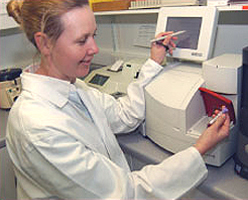 Routine blood tests look at red and white blood cells and various chemicals in the blood. The lab can be used in order to monitor good health (e.g. before an anaesthetic), to diagnose disease, or to monitor the response to treatment. Basic blood screening can identify diseases ranging from anaemia to liver and kidney disease, and from infections to problems with the immune system and diabetes. Many other more complex tests can be performed on the premises.